This is my basic pony pattern that I’ve been using as a base on my quest to ponify all the things. 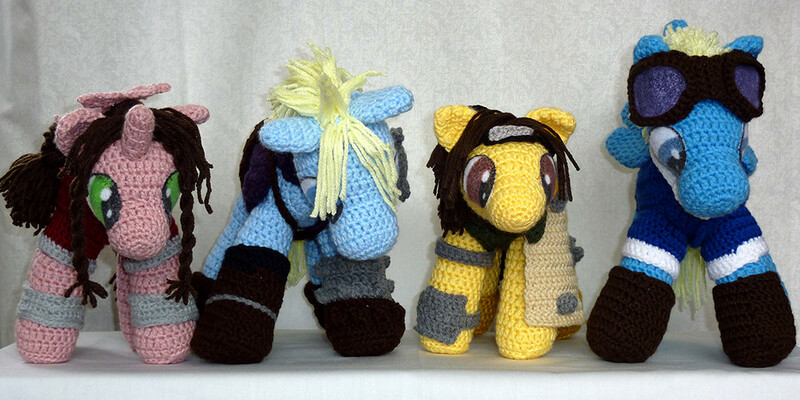 The pony pattern is modified from Hooked on Anime‘s pattern. It may be slightly annoying, but I don’t want to just repost her work, and I definitely don’t want her to go uncredited, so I’m going to link back to her pattern for everything that I haven’t modified. I will put up pictures of a pony in progress at some point for ease of following along. I assemble as I go; this makes me feel like there’s not as much sewing. Stuff firmly. Try to shape the pieces as you stuff them to create the shapes you want. Specific materials are listed for each project, but these are the general materials that I use. The main pony body takes a bit less than 1 skein (128 g) of Impeccable. Everything else is significantly less than 1 skein. 4.5 mm crochet hook – While I’ve been using a 4.5 mm hook, I think a 4 mm would be better. I’d switch, but I don’t want different sized ponies from the same game. 20 dc sts and 11.5 rows = 10 cm using 4.5 mm hook and Loops & Threads Impeccable. My finished ponies are about 25 cm high at the ear. Same as the original pattern, except for round 13, where I sc instead of dc for a smoother finish. Stuff around round 11, then continue to stuff as you go. Also the same as the original pattern, but I hdc instead of dc. I found the heads were really droopy using dc. When attaching, make sure the longer part of the neck faces the back of the head and body. Same as the original pattern, except for round 19, where I sc instead of dc for a smoother finish. Stuff around round 17, then continue to stuff as you go. Same as the original pattern. If you’re going for the Friendship is Magic style nose, follow the original pattern. I don’t actually watch FiM, and was weirded out by the odd pointiness of the pattern, but when I looked at a picture, lo and behold, horrifying pointy noses. It was really scary, so I made a less horrifying nose. Finish. Leave a long tail for sewing to the head. I changed the legs to differentiate between left and right so they can curve around the body better. I also added some increases in the last row to help with that. Finish. Leave a long tail for sewing to the body. Same as the original pattern. It’s not noted, but there will be gaps between each of the feathers. Leave all the yarn tails on the feathers slightly long so you can stitch them up. The wings are not stuffed. Start with the head. I designate the first round as the back because it looks nicer and it’s easier to attach the mane over it. Sew the neck with the long side facing what will be the top of the head over the first round. The centre of the initial ring should still be visible, but not much more. Sew the nose over the centre of the end opposite the neck, stuffing when it’s about two thirds of the way sewn on. I eyeball it and place flowerhead pins along the centre of the top of the head as a guide. Line it up with the body (I designate the first round as the front), and sew it in place about 1 round above the first. Stuff the neck when it’s about two thirds of the way sewn on. Don’t panic if it’s not all straight. Your pony’s just looking around. The ears are not stuffed. Attach them so that they curve slightly up towards the top of the head. Place them about 2-3 cm apart from each other, with the centre pin line in the middle. I place the point closest to the top of the head at around the fourth round. Stuff all four legs almost to the top. You will notice that the right edges are higher on the right legs and vice versa. This is to make curving the legs around the body a little easier and to prevent an ugly indent. You will still need to fold the inner edges of the legs under to make it look really good and keep them from splaying out. I make another centre line of flowerhead pins along the belly as a guide. Place the front legs directly below the neck. Leave a small gap of about ½-1 cm from the pin line. Sew them in place, getting them to curve around the body as best you can. I suggest pinning them in place first, then looking at them from all angles to make sure they’re not askew. Check often while you sew; it’s fairly easy to correct mistakes as you go without having to undo anything. Stuff a bit more polyfil in as you are finishing up. Repeat for the back legs, making sure that they’re lined up with the back of the pony. The gap between the legs doesn’t need to be as big. If you’re attaching a horn, sew it an even distance between the ears and about 1-2 rounds in front of them. I suggest waiting until you have the clothing made if you’re attaching wings, then mark where the wing holes are and sew them on then. That guarantees that you get them in the right spot.